At Perfect Storm, kids enjoy learning new skills using our awesome tumbling and gym equipment and have fun with their friends for a full hour in the gym with a certified instructor. The second hour is spent in the party room for food and fun. Bring cake, goodies, and open presents. 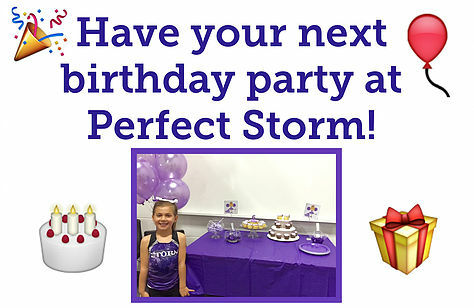 Perfect Storm birthday parties are designed for kids ages 5 and up. Families are responsible for bringing all food, snacks, and drinks for the party as well as any necessary plates, forks, cups, napkins, treat bags, videos, etc. Food and drinks are allowed in the party room only. A fridge and microwave are available for your use. To book your party please fill out the form below or call the gym at 780-782-5808.